Back in June of 2012, a small start-up company by the name of Coinbase had raised slightly over $160,000 in funding with the intention of making it easy for non-technical people to use Bitcoin. At the time, the founder of the company, Brian Armstrong decided to host a Bitcoin meet-up in San Francisco in order to buy a beer with Bitcoin. “It was not as easy as it should have been,” but Armstrong admitted that he was ultimately able to purchase one beer for one bitcoin, which was about $6.50 at the time. Less than one year later, Armstrong’s Coinbase was selling over $1 Million of Bitcoins per month. At that time, Bitcoin was selling for about $22 and the largest Bitcoin exchange was Mt. Gox. Also, Coinbase was now working with $600,000 that it had raised in seed funding. A year later, in mid-2013, Coinbase became, at the time, the highest funded Bitcoin startup when it gained a $5 Million investment from Union Square Ventures. During that period, Bitcoin had fluctuated between a high of $266 in April of 2013 to about $108 when the investment was announced. It was the early days of Bitcoin and acceptance of the currency, although growing, seemed to be fighting an uphill battle to become as wide-spread as Coinbase’s investors would like to see it. In the summer of 2013, Coinbase stepped up to increase the acceptance of the virtual currency by merchants when it announced that it would waive processing fees for its service from merchants until a merchant had achieved $1 million of sales. Fred Ehrsam, co-founder of Coinbase, said: "We want to lower all barriers for merchants to start accepting bitcoin. Before, the savings from processing bitcoin payments rather than credit cards were very compelling (1 percent vs. 3 percent or more). Now, they're impossible to ignore." At the end of 2013, Time Magazine announced that Coinbase was the second most exciting startup of the year (Snapchat was the most exciting). In February 0f 2014, Mt. Gox, the largest Bitcoin exchange, collapsed and many skeptics began to herald this as the beginning of the end for Bitcoin. Instead, merchants like Overstock.com, Dish Network, Dell and Expedia began to partner with Coinbase to accept Bitcoin payments. Much of this had to do not only with the hard work of the visionaries of the company, Ehrsam, and Armstrong but with the ability of the company to learn from and react to mistakes in the past that had created a negative image around Bitcoin. Along with the Mt. Gox collapse and its clients’ lost Bitcoin balances were the attempts and successes of hackers, to steal and create havoc for the virtual currency. Coinbase decided that the ability of Bitcoin to solve so many of the financial transaction problems that people deal with every day was too great to let fail, and their focus had to be on making people feel safe and secure using Bitcoin. Two of the major decisions that they made at this point were to address the security and regulatory concerns around Bitcoin. In order to address the security of a client’s Bitcoin holdings, the company implemented an easy way to store Bitcoin balances into “cold storage”. This approach essentially takes a client’s private keys off of the network and stores them in physical form (USB drives, paper, etc.). Coinbase began to store them in vaults (which is what they actually named the account) and safety deposit boxes at various locations around the world. The other decision that the company made was one that may very well be the most important one they ever made. Recognizing that Bitcoin was creating headaches for government and financial regulators in the US, the company decided to take the approach of embracing discussions and efforts with these regulators. While many in the Bitcoin community saw this as a sell-out to the original intent of Bitcoin, Coinbase saw this as the best way to fulfill their mission of providing an open and innovative financial system that would be embraced throughout the world. Adam White, Vice President of Coinbase, feels that this integration with banking systems allows the company to have a strong impact not only in the U.S. but worldwide as well. "With regulators and banks looking over our shoulder, we have a higher bar to meet," White says. It may be left to history to decide the role that Coinbase played in providing a much-needed makeover for the digital currency and restoration of confidence in Bitcoin, but it has certainly led to a very successful company. In January of 2015, the company raised $75 million to be the single largest venture capital fundraising effort ever by a bitcoin-related startup. The most compelling aspect of this effort was not only the amount, but the fact that the investors were banks and the New York Stock Exchange. It was clear that Coinbase’s interest in building a strong and open relationship with regulators helped to forge this investment. With this investment, Coinbase became the first licensed U.S. Bitcoin exchange. Although it’s not the only place that a user can buy Bitcoin, its approval by regulators allowed it to expand in 24 jurisdictions in the U.S. and "offer greater security for individuals and institutions to trade bitcoin and monitor the real-time pricing of the cryptocurrency", the company told the Wall Street Journal. Now people don’t have to search all over town for “Bitcoin Accepted Here” signs and the market for documentaries about people who lived solely on Bitcoin (thankfully) dried up. With the Shift Card from Coinbase, an individual with access to a Visa debit card could use it to buy goods. This fits very well with the company's desire to increase acceptance of Bitcoin and make it easy for anyone to use the digital currency. They also forged relationships with start-up companies such as Lawnmower, which promotes an easy to use dollar cost averaging approach to buying Bitcoin and will soon feature similar functionality that allows individuals to buy portfolios of Bitcoin and other cryptocurrencies, such as Ethereum. This growth in interest and activity around cryptocurrencies signaled to Coinbase a need to not only allow access to a highly regarded cryptocurrency like Ethereum but to provide the larger (institutional) trader with a powerful exchange that is in line with regulation and allows for worldwide access and growth. So the company expanded its existing capabilities around the Coinbase Exchange to allow for the worldwide growth that was occurring with Bitcoin and cryptocurrency trading. Additionally, the company recognized that the capabilities for this exchange were beyond what was needed for the individual, more "casual" user of Bitcoin so they decided to rebrand this Exchange as the Global Digital Asset Exchange (GDAX) to not only highlight the added capabilities but the worldwide focus that the exchange provides to traders. They also provided access to Ethereum through this exchange to satisfy the growing demand for that crypto asset. Coinbase's White points out the company built GDAX from the ground up. He feels that although there are many smaller exchanges that trade many cryptocurrencies worldwide on a daily basis, Coinbase is in a leading position because of its integration with regulatory concerns and its past success as the leading exchange for Bitcoin and now for Ethereum as well. "We believe exchanges that provide advanced trading features and meet regulatory requirements are most likely to succeed long-term,” White says. 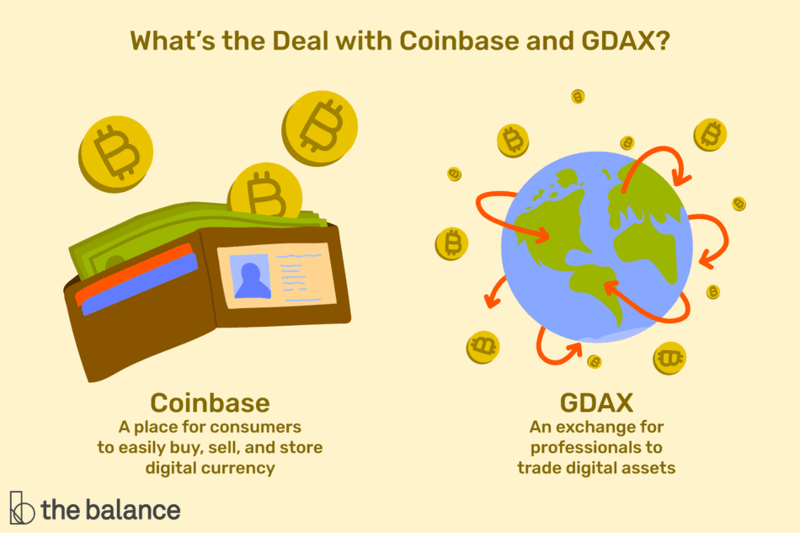 Mid-year of 2016, the company made the decision to rebrand the Coinbase Exchange as part of their business quest to be the world’s largest exchange and expand its international footprint. · Coinbase is a place for consumers to easily buy, sell, and store digital currency. · Coinbase Pro (formerly GDAX/Coinbase Exchange) is an exchange for professionals to trade digital assets. Adam White of Coinbase wanted to make the distinction between the two products clear and also provide insight into the future direction of the company when he told me that, "Coinbase is designed for retail customers while GDAX (Coinbase Pro) is focused on serving sophisticated and professional traders." While it's clear that the company foresees the need for a more professional and regulated exchange to trade the most popular digital assets of Bitcoin and Ethereum, and to do this on a worldwide basis. But the company is also focused on its original mission of providing the ability to easily buy, sell and exchange Bitcoin to those more non-technical and casual users, and they will continue to do that through their existing Coinbase product. Although the company and White see the increased interest in trading Bitcoin, he cautions that the value of the digital currency must be realized through wider acceptance and use. White believes that to gain this wider acceptance, there's a need for continued investment, start-ups and use cases in this area.